Save by registering early for Boulevard Lakefront Tour! The Boulevard Lakefront Tour is a fundraiser for the Active Transportation Alliance. Your registration supports efforts to make it easier and safer to bike, walk and use transit throughout Chicagoland. Active Trans members save! Find out more about membership or add a one-year membership to your registration for just $25, which includes the 2016 Chicagoland Bike Map, a $10 value. If you have trouble registering online, contact our registration manager at [email protected]. If you pedal, you pay. Children in trailers do not need to be registered. However, each youth tandem rider or tagalong rider must register. Boulevard Lakefront Tour takes place rain or shine. Refunds are not available. 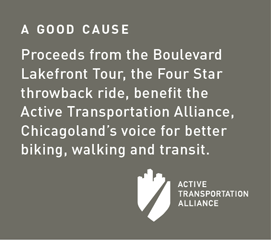 All proceeds from BLT support the nonprofit Active Transportation Alliance’s work to improve biking, walking and transit in Chicagoland.